Good Evening All. Thanks to everyone who joined in with the challenge last week. We saw some brilliant cards. We are now doing a Top 3 as well as a Winner of the challenge. Our Winner will still be chosen using Random Number Generator but our Top 3 is chosen by the Hostess from that weeks challenge. Our winner will receive a Voucher to spend in Willow Designs Store. So here is Anne-Maries Winner and Top 3. 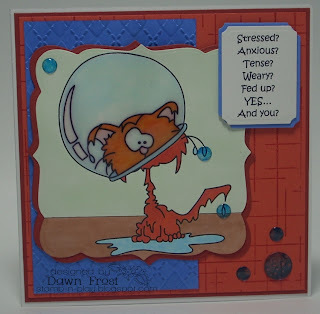 Winner - Dawn Frost with this super card. Please Grab your Top 3 Badge too Ladies. Join us again tomorrow when Its me who is the Hostess. Thank you! How fun to see my name. Congratulations to the other winners - great cards. Whoo Whoo, thank you somuch for picking my card. Congrats to the others, lovely work.